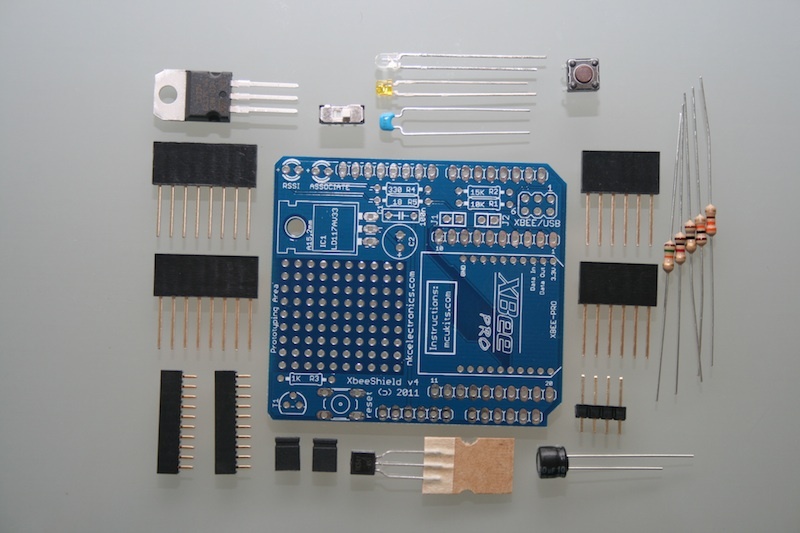 The Electronics Component Kit (ECK) is ideal for electronics beginners looking to experiment with all sorts of components and experienced engineers looking to replenish his/her stock of components. We will be publishing more information about each component and example projects. The LCD module has a backlight made of 2 white LEDs that requiere approximate 9V with a max 19mA current to work. As this voltage level is not available on the Arduino board, I used an ST232 RS232 driver to get 8V DC from the standard 5V Arduino power supply. The backlight driver circuit is in a separate board (yellow) that will be inserted on top of the RGB LCD shield PCB. The LCD part is done. Let’s continue with the Power Supply (Voltage regulator). This part of the circuit, takes 5V from Arduino and using the LM317 variable voltage regulator, generates 2.9V to supply the LCD module. The components are: LM317T, 1 x 10uF electrolytic capacitor, 2 x 0.1uF ceramic capacitor, 1 x 430 ohm resistor and 1 x 330 ohm resistor. The next step is to solder the headers. You need to break the 40-pin male header into 2 8-pin section, 2 6-pin section and 1 1-pin section (just grab 1 pin and twist it until it breaks). Solder the pin headers. The male headers are inserted from the bottom of the PCB to the top. Once soldered, you need to plug this shield to the Arduino board, so you need the long side of the pin header going downwards. The 2×3 female header is soldered backwards, also from the bottom of the PCB to the top, but long leg first. You will also apply solder on the top side of the PCB. Remember that the ICSP pin header on the Arduino board is male, while all the other headers are female. The 6-pin headers are not easy to insert, as the holes are not aligned on purpose to make them fit better. Push this headers all the way in. You will notice slight bending of the pins, but it is ok. 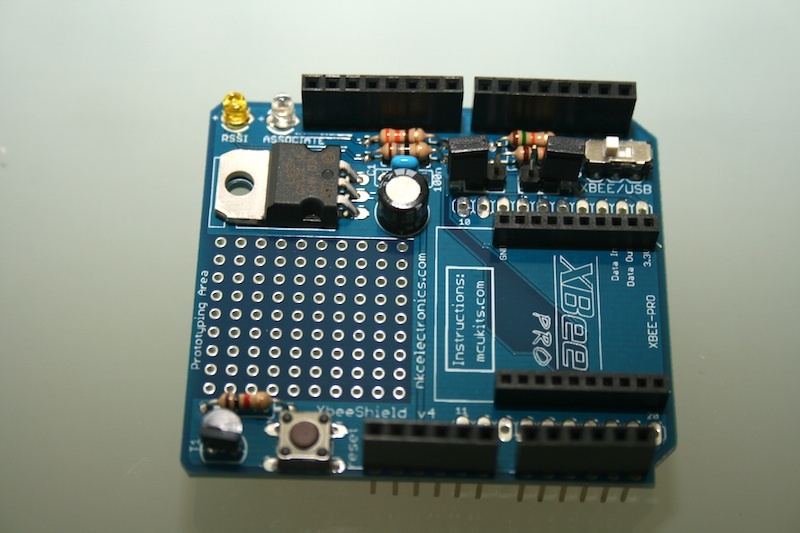 It will make the shield fit tighter on the Arduino board. It is easier to know how all the headers go if you look at the picture of the finished board. The last pin you need to solder on the main black PCB is the 1-pin header. It goes on the left pad of R11. You can see R11 is empty. Next step is to assemble the DC step up converter. 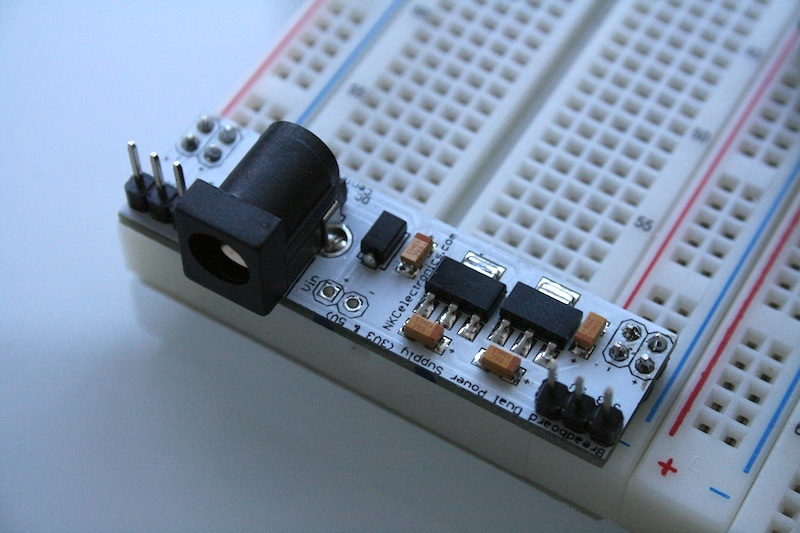 This little yellow board converts 5V from the Arduino board to approx 8V. It is enough to drive the white LED backlight. 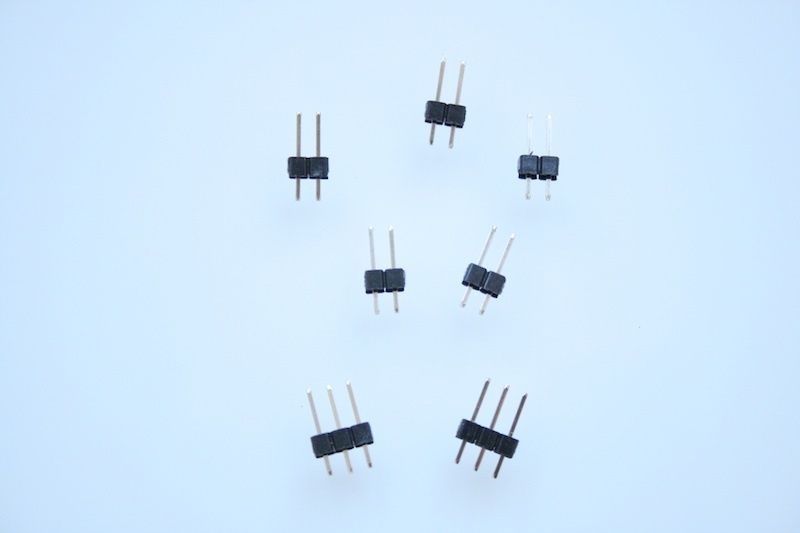 I was looking for a “true” step-up converter, but they are packaged in tiny tiny devices, almost impossible to solder. So I realized that the ST232 with a couple of capacitors can generate 7-12V (even negative! ), and they are cheaper than “true” step-up converters and needs less external components, so I tested this circuit and it worked just fine. Added a 10uF capacitor to filter the 8V output. 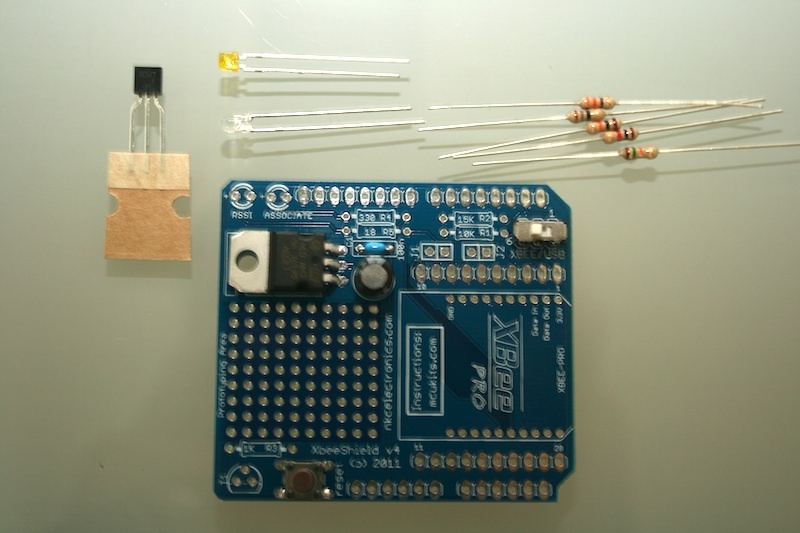 This 8V goes to the Anode of the LCD backlight, but through a current limiting 110 ohm resistor. This tiny board is very easy to assemble, just insert all the components (ST232 chip, 1 6-pin female header, 1 2×3 female header, 3 x 0.1uF ceramic caps, 1 x 10uF electrolytic cap, 110 ohm resistor). And here is the board assembled. 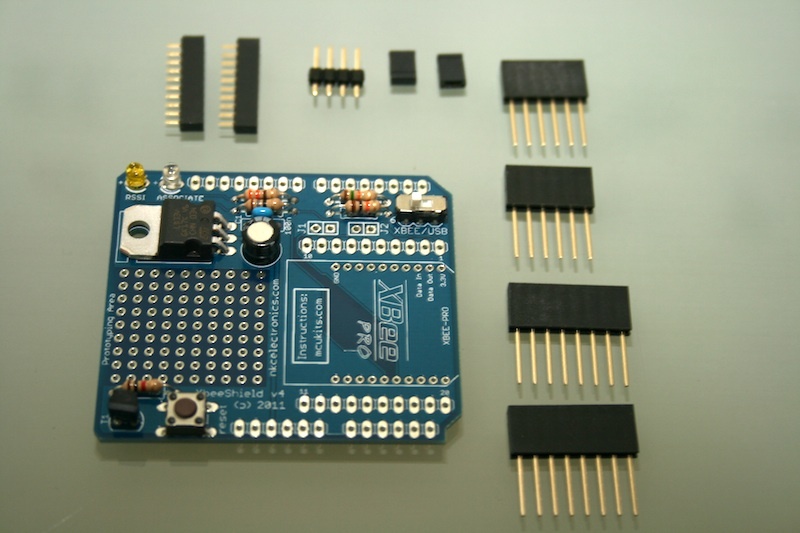 This tiny board must be inserted in the RGB LCD shield board by using the ICSP header and one of the 6-pin female headers. 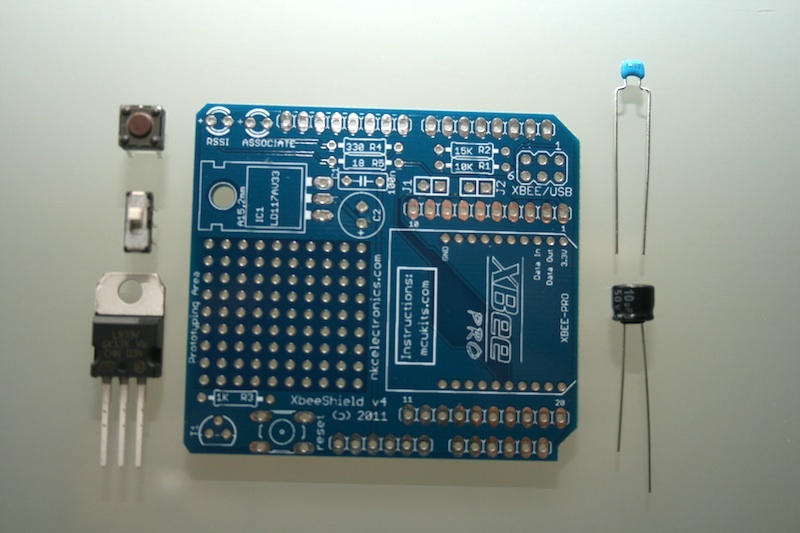 Remember the 1-pin header that you soldered on the left pin of R11? 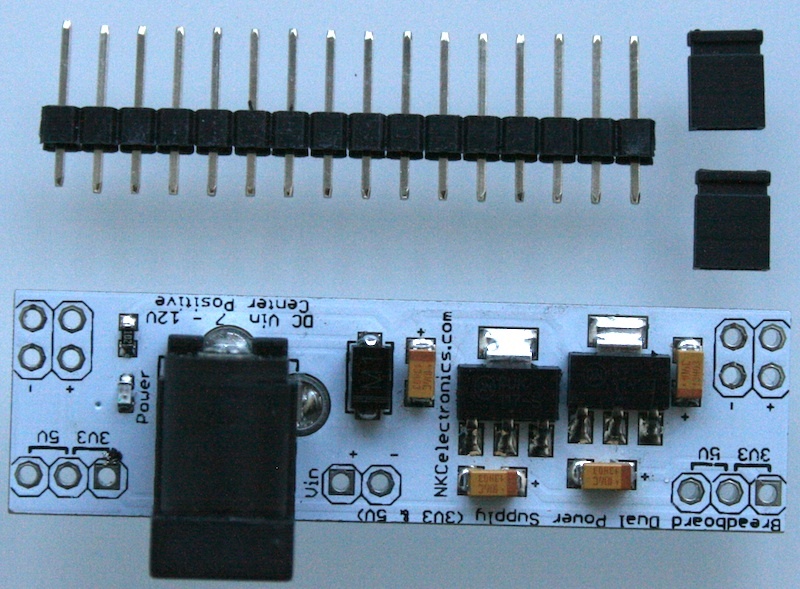 OK, you need to align the 2nd pin from the left of this tiny board to the 1-pin header on the main board. The 6-pin header, viewed from the top, has the following pinout: [GND] [8V] [GND] [GND] [5V] [GND]. 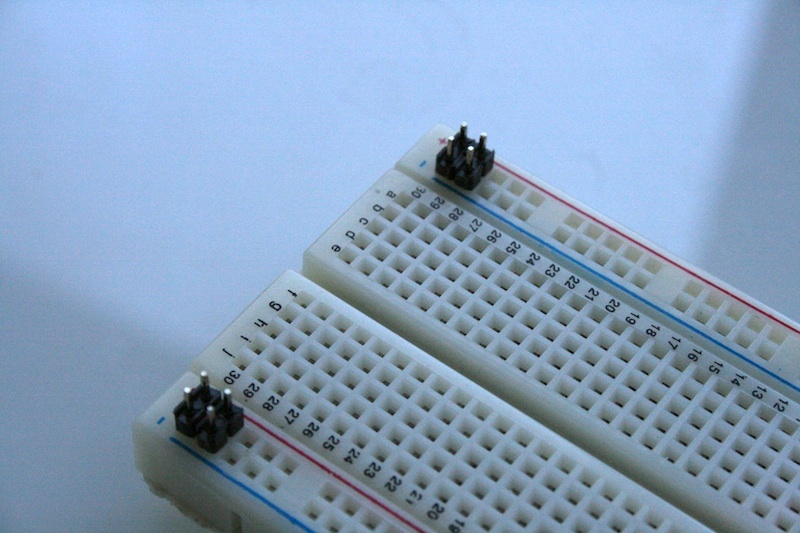 [8V] pin must be inserted in the 1-pin header on the main board. The GND comes from the ICSP header. 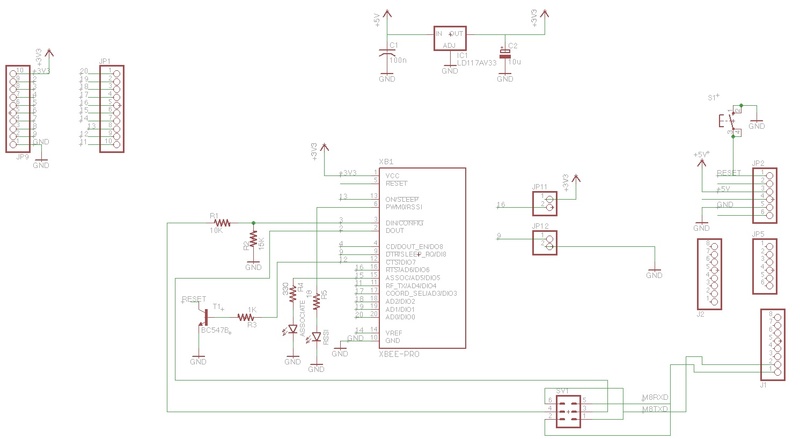 And this is how everything looks when the tiny board (step-up converter) is inserted, the board is plugged to USB and you upload the sample sketch to the Arduino board. 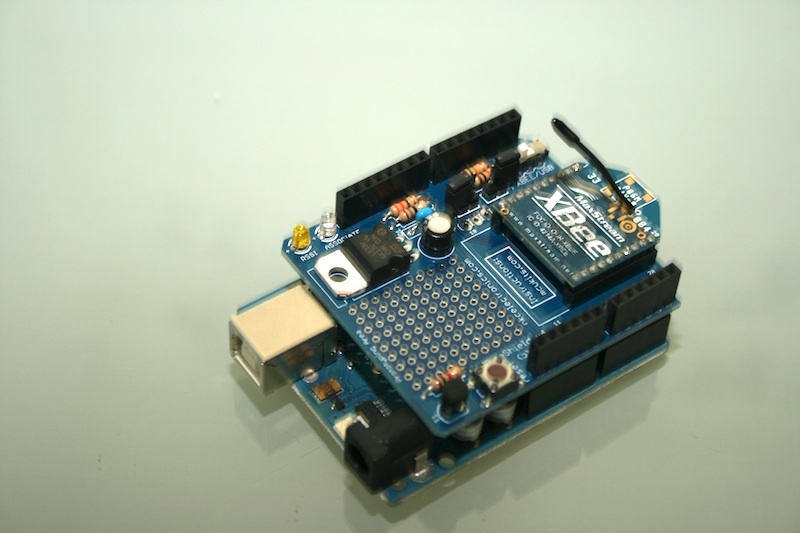 You are currently browsing the archives for the Arduino / Freeduino category.